Whenever I receive a product to test I tend to give it a real world beating to see if it holds true to it’s name. to use. There’s quite a few different SD cards out there, but this one is by far the best due to its super fast speed of 280MB/second. I’ve never seen or used anything like it. After photographing a destination wedding at the beautiful Mana Island Resort off the coast of Fiji, I put the new SanDisk SDHC card through some real world disaster holiday scenarios. The environments ranged from accidentally dropping the card into the ocean for a considerable amount of time through to being x-rayed at the airport. 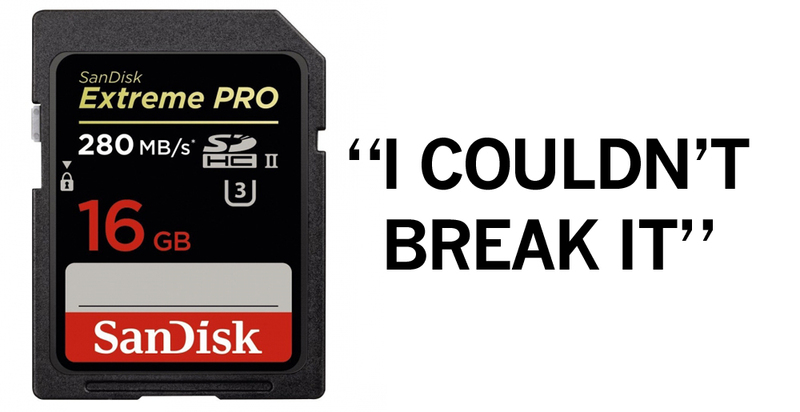 So did the SanDisk 16GB Extreme Pro UHS II (U3) SDHC card survive the onslaught of disasters? I have a question, (which high lights my lack of knowledge). When I download photographs from a memory card, and there is still capacity for the card to store more photographs, and I take more photographs. When I download the new set I’ve taken, will it download the whole contents of the card, whole over again, or will it only download from where I left off?. I’d be grateful if one of you knowledgeable people could tell me the answer to my query?